Residence Life’s Third Sustainability Dinner! Residence Life hosted the third Sustainability Dinner on Thursday night, bringing together many of our friends in the residence halls and across campus who work to make sustainability an Aggie tradition. Faculty attended and enjoyed speaking with students about how their field impacts sustainability. And it was FUN! 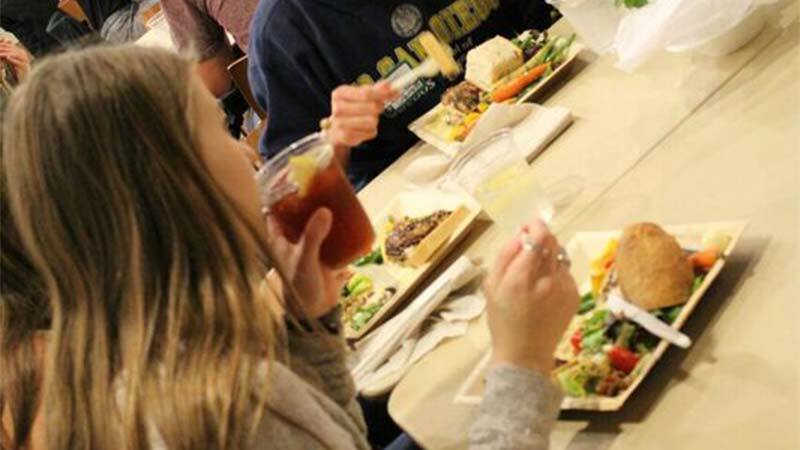 Students from the residence halls were invited to dine with professors and faculty who support sustainability on campus. It was a great opportunity for students to interact with professors in a relaxed environment while enjoying a locally-sourced meal. At the end of the dinner, Residence Life hosted the very first “Sustainability Awards”! We were very excited to recognize the efforts of staff and students who work to make sustainability an Aggie tradition. Sustainability is a team effort at TAMU and these Aggies exemplify that. During the dinner, we also “officially” announced the UES & ResLife Utilities Challenge next semester. ResLife looks forward to working with UES to develop this program for the spring so it benefits our students and serves as a tool for them to create sustainable change at the largest university in Texas. Stay tuned for more details! The Aggie Eco Reps also partnered with Dining Services for Project Clean Plate in Sbisa dining hall Tuesday-Thursday this week. This program raises awareness about food waste by asking students to scrape their leftover food into trashcans during the lunch hours. Over the three day period, this program saw a decline in food waste. Over 600 pounds of food was thrown away during this program but there was noticeable drop in food waste over the course of three days. Moving forward, Residence Life is looking forward to the Texas Recycles Day next week on November 15 in Rudder Plaza from 11-2. Stop by to see us and see all that TAMU contributes to recycling!